D-Carb Balance is a multi-vitamin/mineral supplement formulated for horses predisposed to insulin resistance and/or an inability to metabolize high carbohydrate levels. D-Carb Balance is in a palatable pellet form with a rice bran base. 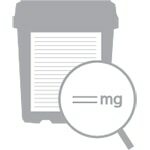 Chromium and magnesium may help regulate blood sugar; contains 4 mg of chromium and 5,330 mg of magnesium per 4 oz serving. Does not contain potassium. Carb-X is designed to help maintain normal blood sugar levels in horses. It provides high levels of magnesium combined with chromium, gymnema sylvestri, and other key ingredients for healthy metabolic function. D-Carb Balance is rated 4.7 out of 5 by 65. Rated 4 out of 5 by Landii from She likes it! This is the third product I'm trying on my 13-hand, 20-year-old paint. Hard to tell under all the winter fur how she is doing after the first bag, but she came in from the pasture this evening at a full gallop--always a beautiful sight for a mare that severely foundered a few winters ago. Rated 1 out of 5 by Kigermom from Contains soy I didn't use it. 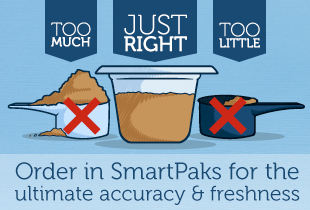 Soy wasn't mentioned on the SmartPak site's list of ingredients. But the bag I ordered had it listed. Customer Service was great and gave me credit. My brother is a crop duster and he said that all soy that isn't organic is sprayed with Roundup. Soy also influences hormones so I don't feed it. Rated 5 out of 5 by Jill from Ease of use This has really helped my horse have better movement and he no longer is sore in his front feet. Rated 4 out of 5 by Chevy from Good resultd I bought this for my 20 year old Morgan mare that has a cresty neck, I want to be proactive in her health so she does not founder. Her diet is orchard grass Low starch and no molasses, or alfalfa. Rated 5 out of 5 by VaPrep from Apparently Yummy My picky Quarter Horse eats this and is doing well. Maybe it's just retirement, but she looks fantastic. Actually, she's probably never looked better. When she was in work, in a full-care barn with half-in/half-out living, and getting all sorts of expensive supplements, I was always worrying about her weight. She seemed to put weight on easily even with daily work and had to wear a grazing muzzle. Now, she is turned out 24/7 with shelter, and gets free choice of hay, grass and water, with one (included) small scoop-lette of of D-Carb Balance in her bowl while her barn buddy eats. She is fit, shiny, happy and not a bit overweight. It may be the lifestyle change, who knows, but I will definitely try D-Carb Balance with my next horse. Rated 4 out of 5 by Lusolady from Some progress being made. I have a 20 year old Lusitano gelding who gains weight by just breathing I think! He gets only 1 hr. of early morning pasture time then is confined to his large stall and runout for the rest of the day except for exercise and riding. He has fat pockets at the shoulders which look like they are diminishing and he has more energy which is really good. I'm thinking there is more to be done but not quite sure what he needs to get him back in shape. Rated 5 out of 5 by Judy1023 from Product works. My beloved, but very overweight black Morgan is slowing turning into a very handsome guy. I have been feeding him D Carb along with plain oats and hay and he has lost his crusty neck, shoulder rolls and overall blubbery look! I also think his coat, mane and tail are in better condition. Rated 5 out of 5 by Linda from Great for insulin resistence horses I have been using this product for several years and the price at SmartPak was below what I could have purchased locally. Rated 5 out of 5 by leopardroan from great multi-vitamin for my easy keeper I started my 13 yr old easy keeper mare on D-Carb Balance after trying Quiessence and SmartControl IR. None of the products have helped manage her weight, but after being on D-Carb Balance for a week, she showed a marked improvement in her coat condition (even after being on Farrier's Formula Double Strength for many years) and attitude. I would highly recommend this product for any horse not receiving a full portion of vitamins/minerals through grain and forage. She'll be on this product for the rest of her life! Rated 5 out of 5 by SgrFlash from Tasty Supplement My horse is not a picky eater but he cleans up every last bit of this supplement. My horse has HYPP so I like that this supplement doesn't have potassium in it. It's nice to not have to worry about adding potassium to his diet but still allowing him to get his vitamins & minerals since he only gets oats and grass hay.